A wolf in a mouse's clothing. 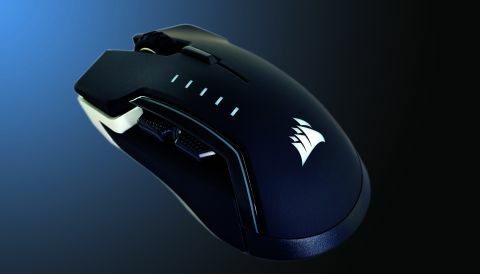 Corsair's versatile gaming mouse does everything, and it does it all really well. Judging a book by its cover is, as your parents erroneously told you when that less-than-attractive classmate asked you to prom, a terrible mistake. This is conclusively proven by Corsair’s Glaive, which couldn’t seem more vanilla when sitting in the box, yet—unlike your awkward, nose-picking dance partner— actually turns out to be damn good company, once it’s out in the world. The Glaive is, as is the law these days, full of RGB LEDs. It forgoes the desktop halo of the likes of the Razer Deathadder Chroma and Asus Gladius II, in favor of a three-zone configuration, which lights the logo, bands on either side of the palm edge, and a pair of front-mounted headlights. Each zone can be intricately, intimately configured, with gradient fades, rainbow effects, flashing colors, or anything you like, though you can’t make any zone display more than one color at once. The LEDs aren’t the brightest, but that suits; they’re placed in understated locations, and aren’t necessarily there to shout, more to whisper your love of colored peripherals. The only other lights on the Glaive come in the form of the DPI markers, which show which of the five DPI levels you’ve selected. Unusually, these aren’t hard-coded into the unit, and can be individually configured, like the LEDs, in the Corsair Utility Engine 2 software, which we should take a second to praise: It’s absolutely wonderful. Every manufacturer has a peripheral configuration app these days, and we’ve not seen one as easy to understand, or as deeply detailed, as Corsair’s. Good job. You can also use CUE 2 to configure each of the Glaive’s six buttons—even the wheel-hugging DPI switcher—to any function or macro you desire, and there is a further DPI slider for a sniper resolution, which (mercifully) isn’t set by default, instead being offered as an option. Switching between layouts is absolutely trivial, so you can glide from a desktop mode to a gaming one in a couple of clicks. The sensor, a custom-built 16,000 dpi number, can be software calibrated, and worked perfectly on each of our test surfaces—it ranges from butter-smooth to outrageously sensitive, depending on your preference. As a piece of hardware, Corsair has clearly put a lot of thought into the Glaive’s construction. It’s beautifully weighted, and while it lacks those gimmicky weights that you can take in and out of certain other mice, we suspect that’s because Corsair’s brainiacs got it right, and knew you would be happy with it as it is. The palm surface is covered in a soft, almost velvety plastic coating—the kind that does degrade over time, so be wary—while the edges and notched wheel are clad in a textured rubber, which grips to your hand if you so much as look at it. What’s more, there’s a gimmick on offer here, and one that works: The panel on the left edge can be quickly replaced. Pull it off, select one of the alternatives, and it mounts itself back on via a combination of built-in neodymium magnets and a subtle alignment groove, giving you the option of a smooth, close-mounted panel, a textured and slightly wider panel, or a thumb-nestling extended curve. While you’re unlikely to need to change them in a hurry, the use of magnets rather than clips is a clever idea, because there’s nothing to really break. It’s difficult to use anything other than superlatives to describe the Glaive. Perhaps, if you have very small hands, it might not suit your particular tastes. Maybe you like your lights more brash and eye-burning, or you’re already tied into another RGB ecosystem. You could be offended at spending $70 on a mouse. But on a comfortable, versatile mouse that will do everything, from desktop to gaming, exactly as you want it to? Well, that’s up to you.